In Canada it has been shown that supervised heroin injections reduce harm in the drug-addicted subpopulation. We had our struggles in Canada introducing safe heroin injection sites. Now more than 10 years later the impressive statistics have convinced mayor Svante Myrick from Ithaca, NY that his town should become the first US city to also have a safe heroin injection site. This made national headlines. It all started in Bern, Switzerland in 1986. In 2003 the first Canadian safe injection site “Insite” was opened in Vancouver, BC. Here are the statistics of this Canadian safe injection site. Despite many critiques all of these programs, wherever they were started, showed that lives were saved, less health care dollars spent and transmission of deadly infectious diseases were stopped. The National Institute on Drug Abuse has published a booklet, which is available online that details how drugs work. It also explains why drug addicted people want to have more drugs and what can be done to help them overcome their addiction. First, it is important to note that drug addiction is a disease like for instance heart disease. The difference is that with drug addiction the disease is located in the brain. 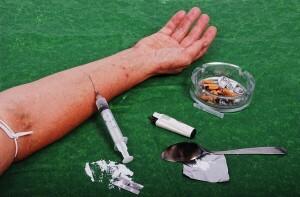 Addiction is initiated by the use of heroin or amphetamines in a young person’s life. This typically happens between the ages of 15 and 25 years. Extra dopamine is released, a neurotransmitter that produces energy and pleasure. The body uses dopamine as a natural substance to reward us. But with drug addiction this becomes a habit. Drug addicts need to repeat taking drugs over and over again. When the effect of the drug wears off, the drug user needs another dose to satisfy the need for more “pleasure”, as the brain perceives it. Unfortunately permanent scarring develops in the brain. This makes it more and more difficult to get the same effect from the same dose of heroin or other street drugs. It is here that overdoses can happen when injections are not supervised. This is where safe injections sites can help. First, a non-judgmental safe injection environment is provided. Secondly, the nurse who supervises the safe injection site facility gradually educates the drug users. This gives them insights as to what they are doing to themselves. People may be judgemental and criticize safe injection sites. But more than 30 peer reviewed papers have proven that they are safe. They are doing exactly what they were set up to do: save lives and prevent the spread of infectious diseases. Supervised heroin injections reduce harm as has been shown in Canada and other countries. This needed service helps reduce deaths from overdoses, cuts transmission of transmittable diseases like hepatitis C and HIV and promotes entry into addiction treatments. It is no longer a question whether safe injection sites work, but rather when one will be open in your community?